All works © Andrea Povey 2015. Please do not reproduce without the expressed consent of Andrea Povey. It was on the 25th June 1483 that three men were executed for treason at Pontefract Castle in Yorkshire on charges of conspiracy and plotting against Richard, Duke of Gloucester. These men were Anthony, Earl Rivers and Richard Grey, brother and son of Edward IV’s queen Elizabeth Woodville, the third man was Thomas Vaughan, chamberlain to Edward, Prince of Wales. These were barbaric times, but an execution within the walls of the town’s castle was nothing new, Richard II was murdered here in the February of 1400, Edward II ordered the deaths of Thomas of Lancaster and twenty rebels, they met their deaths here at Pontefract. Theses men's names and deaths are remembered, the names of the hundreds of other poor souls who died or were imprisoned during the Wars of the Roses are not. There is no record of exactly where within the castle Vaughan, Grey and Rivers met their deaths. Maybe it was at ground level in the centre of the castle, or high up on battlements. What was Thomas Vaughan's last view of the world? Was it the grubby, hay-strewn castle floor or the vast green fields where men of York and Lancaster alike ended their days, we will never know, but within minutes, Vaughan's blood and that of his associates may have seeped through the stone work and ran over the castle walls before it flowed into the streams to join with blood spilt only twenty years before. 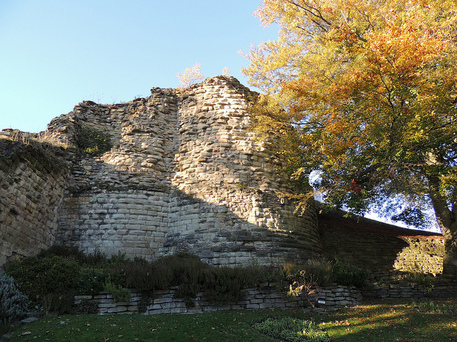 Thomas Vaughan’s story ends here in Yorkshire’s Pontefract Castle but it began in what is now Monmouthshire in Wales in the second decade of the 15th century.